When he wasn’t writing cosmic horror about indescribable beings, H.P. Lovecraft considered himself a poet. I’ve mentioned his Christmas poetry in the past, and since today is Halloween, I thought it’d be fun to take a gander at another holiday poem. Hallowe’en in a Suburb was originally published as In A Suburb in The National Amateur in March of 1926. The poem was later renamed. I spent some time researching why the name was changed, but I couldn’t find an answer. The poem stands on its own without the Halloween association, but there is a definite fall/harvest feel with reflection on sheaves and chill winds. Perhaps it was marketing? It’s not half bad as far as creep poetry goes, and it’s certainly better than his cat-centric silly Christmas poetry. The very talented Andrew Lehman cut a record for Cadabra Records where he reads several of Lovecraft’s poems including this one. The record doesn’t appear to be available anymore, but you can listen to Hallowe’en in a Suburb and The Cats below. Have a happy and safe Halloween everyone! Remember that today is the last day to get FREE SHIPPING on any signed paperbacks from my store. Just use the code BFCMONTH on checkout. You can see all the details in this post. In 1895, Robert W. Chambers published The King in Yellow a collection of short stories. Over the years, it has become his seminal work, and due to Lovecraft’s interest in the book and his incorporations of Chamber’s ideas, The King in Yellow inevitably became connected to the mythos. Chamber’s eponymous King in Yellow, became Lovecraft’s Hastur, and the empty streets of dim Carcosa are now as familiar to cosmic horror fans as the sunken city of R’lyeh and the sagging gambrel roofs of Innsmouth. For a long time, fans of Chambers’ work have hunted for The Yellow Sign. After all, it is important enough to justify a story within the book. But, unlike Lovecraft who was fond of random sketches, as far as we know Chambers never drew out the symbol. All we have are his descriptions. So what is the Yellow Sign? Did Chambers leave us any clues outside his story? First, we need to address the Ross Sign. In 1989 Chaosium released The Call of Cthulhu 4th Edition, a role-playing game based on Lovecraft’s mythos. Within the supplemental book, The Great Old Ones, game designer Kevin A. Ross created a striking symbol of The Yellow Sign for his adventure scenario entitled Tell Me, Have You Seen the Yellow Sign? In the years since Ross’ symbol has become the go-to image whenever anyone evokes The Yellow Sign in popular media. A quick google image search will reveal a few variants, but most follow the same pattern. But, as engaging as it is, it’s important to note that the Ross Sign is not official. It’s not the mark described by Chambers, merely an interpretation by Ross adopted by the community at large. So what is The Yellow Sign? To find out, it’s best to return to the text where we find it described. That quote taken from The Yellow Sign, (the fourth story in The King in Yellow), led me back to the original 1895 edition published by F. Tennyson Neely. They’re difficult to find physically, but most have been scanned are now available to read online. While the interiors were sparse, I found a few original covers of the first edition, which had a variety of printings featuring different covers. The books above are ordered by the print run. You’ll note, that each cover bears a similar symbol with strange angles and sweeping curls. At fist glance, it certainly fits the description. It’s script like, and could easily be reminiscent of non-English glyphs. I did some work to pull the icon from the old covers so we could see it without all the filigree. I’m dubbing this the Neely Sign, and I was ready to accept it as the official version. And I wasn’t alone, I’ve seen it used by others. It’s clear that it’s in the zeitgeist just not as popular as the Ross Sign. It is similar to the description, looking not unlike Arabic letterforms or Chinese hànzì, but it’s clearly not born of either. I can see the appeal. My own rendering of Aklo follows similar patterns, loops, dashes, and dots. (You can see the writing here, just scroll down to book IV, V, and VI.) However, after some digging, I came across another cover; a cover that ruined any assumption of the Neely Sign being our infamous Yellow Sign. Anthony Hope’s Father Stafford features the same mark, and it’s important to note that this book isn’t connected to the mythos. It has been described as a “county-house comedy” which is far different from the grim nature of The King in Yellow. So if that is The Yellow Sign on the cover it would be wildly out of place. So what is it? The connection lies with the publisher. Both Father Stafford and The King in Yellow were published by F. Tennyson Neely under the Neely’s Prismatic Library imprint. You can easily see the letters F, T, and N in the symbol, and the periods clearly indicate initials. 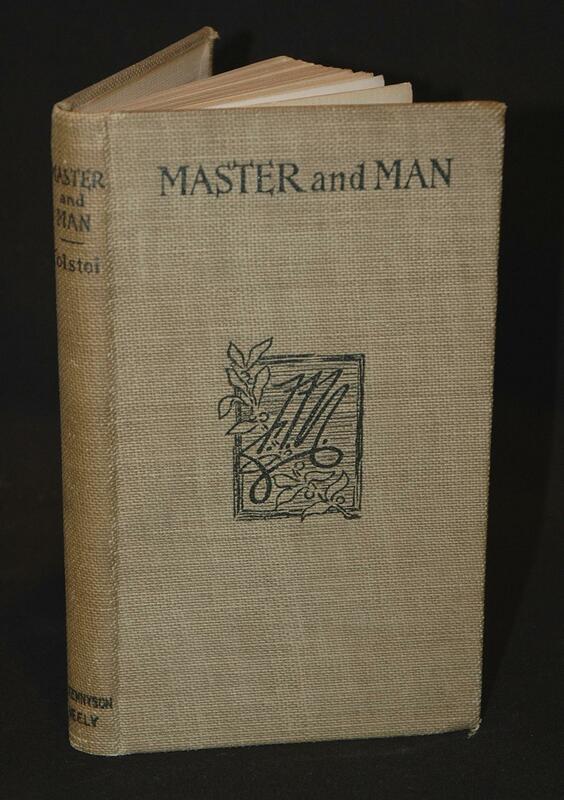 Further research found the symbol on other covers as well, including this copy of Master and Man by Tolstoy. So, it seems the Neely Sign was the publisher’s mark and not the official Yellow Sign as many have hoped. So I was back to square one… or was I? I eventually found an old post from 2010 on of my favorite blogs, Propnomicon. It’s a fantastic site focused on documenting the creation of realistic props that evoke Lovecraftian mythos (and horror in general.) Within the post, they suggest that the image on the spine of third first-edition printing (and arguably the most memorable) might be The Yellow Sign. It begged a closer look. It’s a remarkable symbol. You can see a similar object held by the figure. A torch consuming itself, or a burning scepter perhaps? When isolated it looks a bit like a caduceus turned upside down. Could this inverted caduceus, a symbol typically used to represent healing, be a representation of corruption? I think there is merit in that interpretation. After all, Hastur clads himself in yellow, which is opposite on the color wheel of purple, the standard color of royalty. Even Carcosa itself is often shown as a corrupted reflection of our world. Plus when stylized, the inverted torch looks like something you could see embroidered on the stoles and hoods of a Yellow King secret society. It has a symmetry, not unlike the Rebekah’s beehive or the Masonic square and compasses and that is advantageous in a symbol’s use. Effective symbols are easy to reproduce, and while the Ross and Neely signs are interesting, they’re overly complex. By this point, I think it will be difficult to uncouple popular culture from the Ross Sign. But, personally, I’ve become a fan of the inverted torch and I will probably go forward using it to represent Hastur within my own work. I like that it has more connection with the original text than the Ross creation and it’s not a misinterpretation like the Neely Sign. Even if it doesn’t fully match the description it’s visually evocative. While there have been other less grounded interpretations, there is no one definite answer. Chambers, for his part, was vague; I’d wager that was intentional. He left the titular Sign open to discussion and that is why it remains undiscovered. For me, that adds to the myth and it helps expand the world of cosmic horror. The mystery becomes a part of the draw and that is something I can appreciate. 1 It should be noted that Ambrose Bierce was the first to name both Hastur and Carcosa. They appeared in his short stories Haïta the Shepherd, and An Inhabitant of Carcosa found in his 1893 collection Can Such Things Be? Both stories were drawn upon by Chambers for The King in Yellow. 2 It’s important to note that the Ross Sign that we see today is actually a corruption of Ross’ initial design. Chaosium printed the image both upside-down and backward. 3 See True Detective’s use of the Archimedean spiral and deer antlers, objects more evocative of Ireland’s Newgrange than the standard “symbol from beyond” typically found in cosmic horror.